Would you believe that I used to live every day in a pair of leggings? I owned that many that they literally fell from every draw and clothes storage unit I could pack them into. For me leggings were a comfort, I felt that they looked ok, and it meant that I didn't have to worry so much about my weight. You see underneath the smile, I was more than a little bit aware that I had gained a few lbs (and the rest!). It was because of this that I point blank refused to wear anything but leggings, and any denim I owned had been either given away or pushed to the very back of my wardrobe with the intent that...One day I could fit back into it. For me jeans were the ultimate insult, they pushed your love handles together and really did have the pretense to make me feel that much worse about myself, where as leggings would sit underneath a baggy top or dress and allow me to face the world. It really was a confidence thing for me and deep down I didn't think that I would ever have the motivation to get myself where I knew I wanted to be. 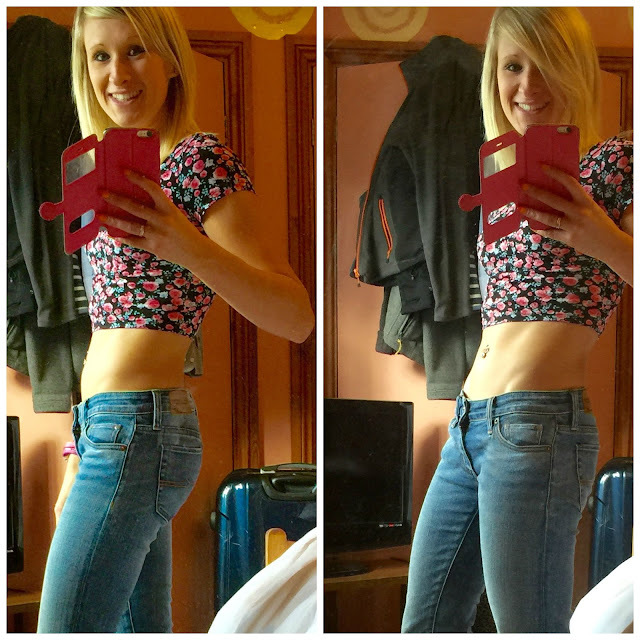 In August 2014, a mere 2 months into my fitness mission I purchased my very first pair of jeans, and I decided there and then that the time had come to say goodbye to the leggings that had monopolized my wardrobe and my life. I cannot express how different I feel being able to wear everything that I had longed to, and knowing that I have got to where I am today by hitting some pretty enormous goals makes that feeling feel even more amazing. In all I lost 2 stone in the year that followed my fitness revelation, and of course when you drop 2 dress sizes you soon discover that you are going to have to replace your entire clothes collection. It means that you get to take absolutely everything you own to a charity shop, it means you can hop online and buy a new outfit for every day of the week, you literally need to replace the entire contents of your wardrobe from outfits to underwear! Of course it has meant that I have been able to purchase a collection of jeans, and really feed my passion for denim. Esprit have a great selection of different jeans from skinny though to wide, and it has enabled me to shop the new season looks in one place. I cannot even beging to describe the feeling when you can look at yourself in the mirror, and for the first time in a very long time, be happy in the skin that you are in. Self confidence is such an important mind set, and I truly believe that absolutely every women has the right to that feeling when they look in the mirror.